Click the button below to add the Certified Angus Beef Choice Filet Mignon Steaks to your wish list. Buy the best filets online! Our tasty and tender fresh Filet Mignon Steaks are sure to impress your guests at your next elegant dinner or outdoor cookout! Cut from the heart of the tenderloin, using USDA inspected, grain-fed beef, our fresh Filet Mignon steaks are hand-trimmed and aged to peak flavor and tenderness. Each fresh Filet Mignon steak is approximately 3/4 inch thick. Place your order today! Mikes Country Store offers a 100% Guaranteed Quality to all customers. If you are not completely satisfied, we will give you a refund. Place your order today at Mikes Country Store online, Risk-Free! 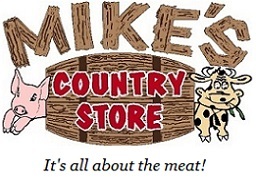 Mikes-Country-Store.com sells fresh Ribeyes, New York Strips, T-Bones, Sirloins, and Ground Chuck Burgers. We even sell Beef Jerky! We also have specialty items to compliment your meat, such as our rubs and sauces. Whether it is Beef, Pork, or Chicken you are looking for, we sell beautiful USDA inspected meats that are sure to impress your guests.